Ciao! Grab a cooling glass of water, and settle in! Rosalind and I spent the first week of August in the North of Italy and it was fantastic. Incredibly hot, but still fantastic. We stayed with two families - one near(ish) Venice, and one near Genoa. Rosalind met them several years ago when she taught Drama in Italy as a student. I can whole heartedly recommend staying with actual Italian families - they are so friendly, and the food is amazing! The holiday took on several trips to beautiful parts of the local regions in extraordinary temperatures. You thought London was hot in this heatwave; let me tell you - it’s got nothing on Venice! 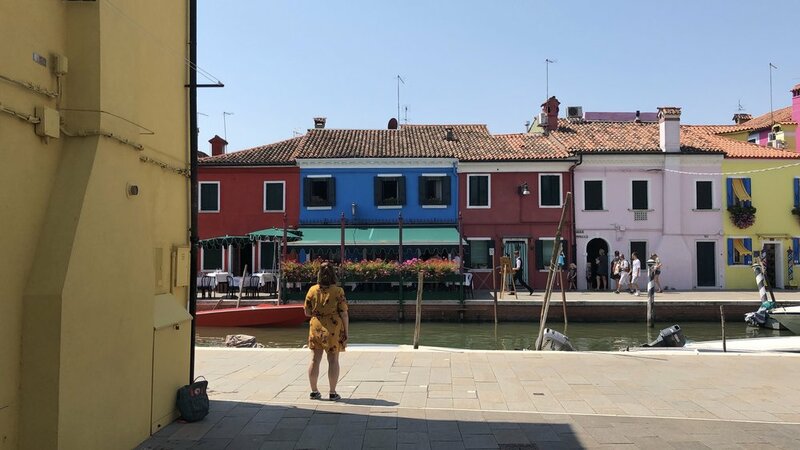 We went for a trip to the watery city, and specifically to two of its islands - Murano known for its glass-making, and Burano known for its intricate lace. We had a great time. Though by the end of the day I stank to high heaven. Never has a shower been more richly greeted. The view from the railway station is not so bad. We travelled by boat to the islands, and we mostly slept to try and get our minds off the ASTONISHING HEAT. On Murano we saw one of the glass-blowing masters give a demonstration, making a vase (which you can see pictured below) and a horse. It was fascinating to watch and ASTONISHINGLY HOT. In Burano we learnt that it takes seven lacemakers to make a sigle piece of lace; each one focusing on a single pattern in the whole. It is also an island full of colourful houses. We stopped off for a coffee at the Malga of a friend of the family, and a walk around a lake. I found a great tree. Then we took three trains for a six-hour journey across the country, to end up in Liguria. More or less the first thing I did was go for a swim in the sea with the father of the family; the second thing we did was have a delicious meal with the extended family. What an introduction. And the next day we headed down the coast for another boat ride. Camogli is a typical Ligurian town, with tall apartment blocks in lovely shades of peach and pistachio (speaking of which, we had some great gelato here as well). We traveled down on the train, which was delayed by about 45 minutes. We had been warned of the Italian rail system the previous evening, so we felt honoured to see it in (in)action. From here we took a boat to the stunning beach of San Fruttuoso. San Fruttuoso is a beautiful, remote little beach, where you can swim whilst being serenaded by cicadas. You can get out of the sun in the simple church, and see a replica of the underwater Jesus, who lurks in the waters nearby. The final day of our trip we spent in Arnzano, where our hosts live, and in the sea at Cogoleto, nearby. The perfect end to a wonderful trip.